After a protracted delay, Netflix and Marvel announced that Finn Jones, the actor best known for playing the Knight of Flowers on Game of Thrones, would play Iron Fist. Aesthetically speaking, he looks like the original comic-book character, Danny Rand: He’s a blond-haired, blue-eyed pretty boy. But for many, casting Finn Jones was a missed opportunity. The story of Iron Fist is one steeped in a familiar exoticism: Danny Rand journeys to the mystical land of K’un Lun, where he learns ancient martial arts only to become — surprise! — better than the original practitioners. The idea of casting an Asian-American Iron Fist became a cause célèbre within the Asian-American community due to the article “Marvel, Please Cast an Asian-American Iron Fist,” written two years ago by Keith Chow, the founder of the pop-culture site Nerds of Color. From there, the blog 18 Million Rising began a petition to cast an Asian-American in the part, and a spirited, if not heated, conversation started around it. Vulture spoke with Chow to begin answering some of the questions you might have about what’s at stake in this debate. Here are answers to six questions you might have about why there was a push to make Iron Fist Asian-American. 1. 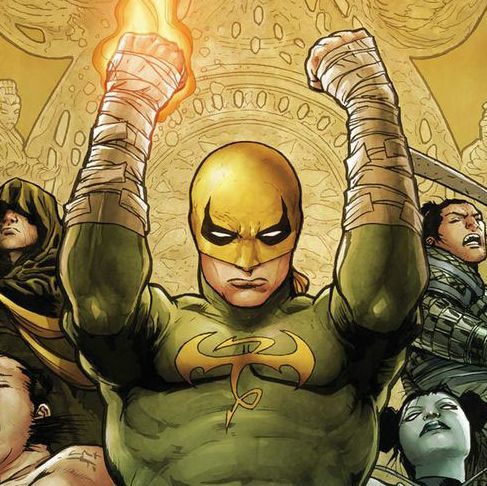 Wait, so, who exactly is Iron Fist? 2. Why would you want to change the race of the original character? Simply speaking, recasting Iron Fist as an Asian-American would not only have created the first Asian-American lead in the Marvel cinematic universe, but it would have offered a simple solution to the much thornier problem of orientalism in the show. “For me, the whole idea of an Asian-American Iron Fist has been less about the character specifically but the trope more broadly,” said Chow. “Like you have a ton of these stories already. If you need that story told, go watch The Last Samurai! Go watch The Karate Kid 2!” Instead of a white man appropriating the qualities of Asian mysticism, it could have been a story of an Asian-American going back to his parents’ homeland as a way of reconnecting with them — a feeling that many second-generation Asian-Americans can relate to. There aren’t yet plot details from the show, so it’s possible that the series would skip Rand’s origin story entirely as a way to avoid its icky implications — but the fact that he’s a white guy powered by Asian magic would remain. 3. Would casting an Asian-American fundamentally change the story? The point, of course, is that second-generation Asian-Americans (and beyond) would still feel out of place in a mystical Asian realm, and the story could explore other nuances of identity if the person were an adoptee or a mixed-race Asian-American. Their relationship with a place like K’un Lun would be fraught, personal, and immediate. 4. But shouldn’t you remain faithful to the “canon” — that is, the original source material? The question instead pivots to one about the essence of a particular character, and whether you believe race is a necessary component. “Making Danny Rand Asian-American does not change the essence of who he is,” said Chow. “Now, if your argument is that the essence of who Danny Rand is, is that he is a person who has benefited greatly from white privilege and entitlement, then okay, maybe that’s probably right.” The more uncomfortable question, too, is that if the canon is inherently something sexist, racist, or homophobic, then why is it something that we need to remain faithful to? 5. Is it stereotypical to just see another Asian-American as a martial-arts superhero? 6. Are comics more diverse now? Why Should Iron Fist Be Asian-American?